Before you buy a home, it’s important to make sure that it’s structurally sound and there are no major defects with the property. 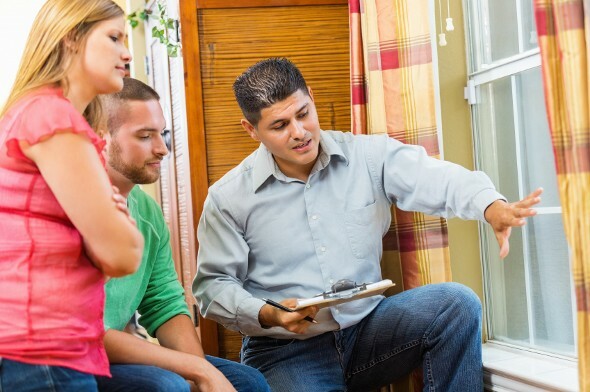 A professional home inspection isn’t always required unless it’s specified in the loan contract, but it can be to your advantage to schedule one. If there’s something seriously wrong with the property, it’s better to know that before the mortgage deal is finalized. Here are answers to some of the most common questions about home inspections. When an inspector comes out to take a look at a home, it’s important for him or her to thoroughly inspect the inside and outside areas. On the outside, some of the things inspectors keep an eye out for include: cracks along the walls (especially near the foundation line), missing siding or damaged brickwork, damage to the roof and issues with attached structures such as garages. On the inside, the inspector would likely check for leaks and fire hazards. They also test the heating and air systems as well as the hot water tank. He or she would probably examine the plumbing and the wiring to make sure they’re up to code and there’s no visible damage. An inspector would also look at the ventilation system in the bathroom and check the smoke detectors. If there are appliances in the home, the inspector may test them but it’s not always mandatory. Anything that would require the input of a specific expert like septic systems and a detailed inspection of insect damage would likely not be covered. 2. Who’s Responsible for Hiring the Inspector? Unless you’ve negotiated with the seller to cover the inspection fee, you’re likely responsible for paying for it out of pocket. The cost is usually somewhere in the neighborhood of a few hundred dollars. If you need the help of someone more specialized, like a structural engineer, it may be higher. In some states like Arkansas and Florida, the inspector you choose must have a registered license. If you’re not sure where to find a licensed inspector, you can usually ask your real estate agent for a referral. It might also be a good idea to check the potential inspector’s license and other professional certifications before shaking hands on the deal. 3. What Happens if the Inspection Uncovers a Problem? In most cases, a home inspection only reveals minor issues, but some homebuyers get a shock when they find out that there’s something seriously wrong with the property they’re looking at. If that happens, you basically have two options. You can back out of purchasing the home without facing any consequences if your contract includes an inspection contingency. If the house requires extensive repairs, it may not always be worth it to spend the extra time and money fixing it. The other choice is to negotiate with the seller to cover some or all of the cost. You can ask them to reduce the asking price by the amount of the repairs or to pay outright for what needs to be done. If they don’t want to do either, you can also request a cash credit when you close so that you can borrow the money and handle the repairs yourself. Try our free mortgage calculator. 4. Can I Skip the Inspection if I’m Buying a New Home? The answer to this question is yes, but it doesn’t necessarily make sense to do so. Just because a home is brand-new doesn’t mean that it’s guaranteed to be problem-free. If the construction crew or the builder did sloppy work or generally cut corners, you might have issues down the road. Getting an inspection can make you feel better about your purchase when you know your brand-new home is in top condition.